Fifa will decide whether to release its World Cup corruption report within the next few hours - with president Sepp Blatter holding the key to the outcome. A number of Fifa executives want the entire 430-page report published, but Blatter may limit who is able to vote on the decision to release it. Only a summary has been released so far, angering author Michael Garcia, who claims parts of it are "erroneous". Leading members of football's governing body are currently meeting in Morocco. Blatter has suggested in the past that only those executives who decided, back in December 2010, to award the 2018 and 2022 World Cups to Russia and Qatar respectively should be able to vote. 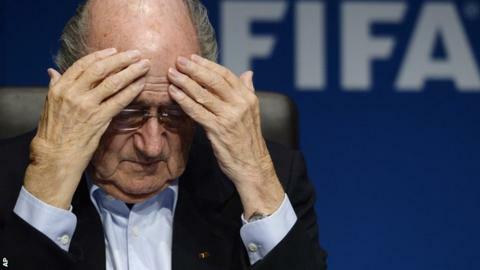 Sources close to the Fifa president believe that, as of Thursday night, he was still undecided about what to do. Fifa's executive committee consisted of 22 members in December 2010 but of those original 22, only 13 still remain. It means that 12 members of Fifa's committee, which now consists of 25 people, plus two co-opted members, would not be eligible to vote. Friday's meeting in Marrakesh is expected to conclude around 1200 GMT. Blatter will then speak to the media from around 1300 GMT. Garcia, an American lawyer, heaped further pressure on Fifa in the run up to this week's two-day meeting in Morocco by resigning as its independent ethics investigator. He claimed the summary of his two-year investigation into allegations of corruption was "incomplete and erroneous". Asked if Garcia's resignation was a new low for world football's governing body, Fifa vice-president Jim Boyce, from Northern Ireland, responded: "I don't think there's any doubt about that." Britain's most senior football official said he has always thought "as much of this report as is legally possible should be put in the public domain". He added: "Until that is done, it's not going to go away. If people have nothing to hide, why are they afraid of something being issued?"